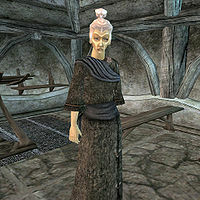 Estirdalin is an Altmer mage and Apprentice of the Mages Guild. She offers spells, medium training in Destruction, and minor training in Alteration and Illusion at the Balmora Guild of Mages. She is wearing a common robe along with expensive shoes and a matching ring. As a weapon, Estirdalin will use a steel spider blade. Aside from her natural weaknesses to fire, frost, shock and magicka, her natural bonus to magicka, and resistance to disease, she knows a wide variety of spells. Specifically, these are the spells that she will sell to you. When talking to a mage, they might tell you to talk to Estirdalin but incorrectly refer to her as a man. Fleabite is especially notable as only two other spell merchants will sell you a Damage Fatigue effect.